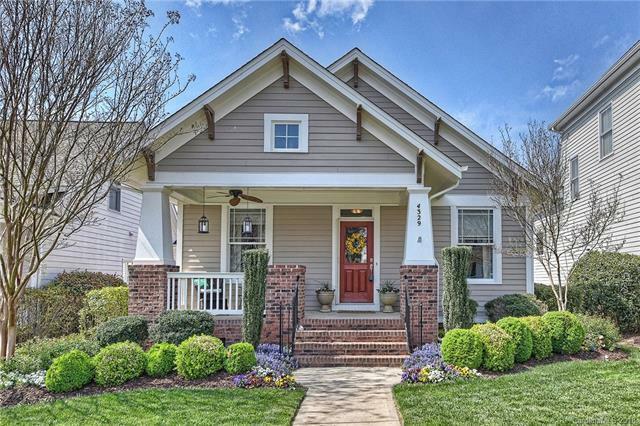 This adorable home will not fail to impress! Rare ranch plan in Baxter Village! The home has been maintained to perfection and is as clean as a whistle! Beautiful hardwoods throughout the home, with the exception of two bedrooms. Lovely Southern Front Porch for relaxing & chatting with the neighbors! Upgraded kitchen that includes granite, stainless steel, tile backsplash & 44" tall cabinets. Open plan with cathedral ceiling in family room and custom built-ins for all your books and collectibles. Master Bath has separate tub and shower and gentleman's height cabinets. Two additional bedrooms, one of which has french doors that could be used as a home office/flex space. Fresh whole house exterior paint in 2015. Finished garage has cable connections - a perfect man cave! Phantom Screen installed at front door for fresh air during spring & fall months. Composite Deck and Professional Landscaping complete this gem of a home! Walk to pools & parks in amenity Rich Baxter Village!